Two associates reportedly claim the longtime Republican strategist Roger Stone told them had had learned from WikiLeaks founder Julian Assange that the organisation possessed a batch of hacked Democratic emails months before the public became aware of the fact. Former Trump campaign adviser Sam Nunberg and a second unnamed associate both say Stone claimed to have met with Assange in 2016. Stone has repeatedly said he has never met with or directly spoken to Assange, and that he had no communication with WikiLeaks. Stone told Business Insider on Tuesday that he told Nunberg he was meeting with Assange in jest and had no recollection of having another conversation about Assange with anyone else. He said Nunberg had called him three times to tell him the special counsel Robert Mueller was “out to get” him. Two associates of Roger Stone, a longtime Republican strategist and informal adviser to President Donald Trump, said he was aware that WikiLeaks founder Julian Assange was in possession of a trove of hacked Democratic emails months before they became public, The Washington Post reported Tuesday. According to the report, Stone told an unnamed associate in the spring of 2016 that he had learned from Assange that WikiLeaks had obtained the hacked materials that would later become a thorn in the side for the Hillary Clinton campaign. Former Trump campaign adviser Sam Nunberg also told The Post that the special counsel Robert Mueller had asked him about a conversation during which he said Stone told him he had met with Assange. Stone pushed back on parts of The Post’s story in a lengthy statement to Business Insider on Tuesday morning, saying Nunberg’s statement to the outlet does not amount to evidence against him. He said he had “no advance notice of the content, source or timing of the WikiLeaks publication of any material,” and that he never met, spoke with, or emailed Assange. Stone said Tuesday that he told Nunberg in jest that he was meeting with Assange as a way to get him off the phone in 2016, and that he did not recall having any conversation about Assange with a second person. “Sam asked if I had plans for the weekend – and I said I was ‘flying to London to have dinner with Julian Assange.’ A joke and hung up,” Stone said. “My passport shows I never left the country in 2015 or 2016 and surveillance cameras for [Assange] at the Ecuadorian Embassy show he never left there and I never arrived there,” Stone said. “I told ONE person … who was too intense to figure out it was a joke,” he said. He also said that he did not receive any of the hacked documents or pass them onto Trump or the Trump campaign, and that he did not “collaborate” with WikiLeaks at any point during the campaign. Stone did not respond to follow-up questions about his communications with WikiLeaks and the timing of his tweets during the campaign. 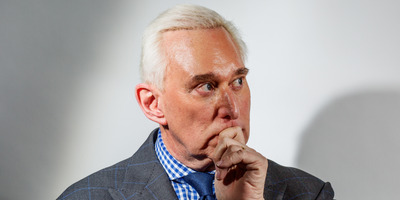 Stone sent out a series of tweets in 2016 that raised questions about whether he knew in advance that WikiLeaks was planning on publishing Clinton campaign manager John Podesta’s hacked emails. Stone told the House Intelligence Committee last September that he had never “said or written that I had any direct communication with Julian Assange and have always clarified in numerous interviews and speeches that my communication with WikiLeaks was through the aforementioned journalist.” Stone was referring to radio host Randy Credico, who Stone said acted as an intermediary between himself and Assange. WikiLeaks also tweeted in March 2017 that it had “never communicated” with Stone. But The Atlantic reported last month that Stone was in direct contact with the group in the weeks leading up to the November 2016 election. “Since I was all over national TV, cable and print defending wikileaks and assange against the claim that you are Russian agents and debunking the false charges of sexual assault as trumped up bs you may want to reexamine the strategy of attacking me,” Stone reportedly wrote on October 13.